So much nonsense has been said about president Ahmadi-Nejad and his working class hero cabinet members. As always, as soon as I hear anyone pretending to be some working class hero, or hear the words, the government of the disposessed and all that garbage, I feel nauseated. 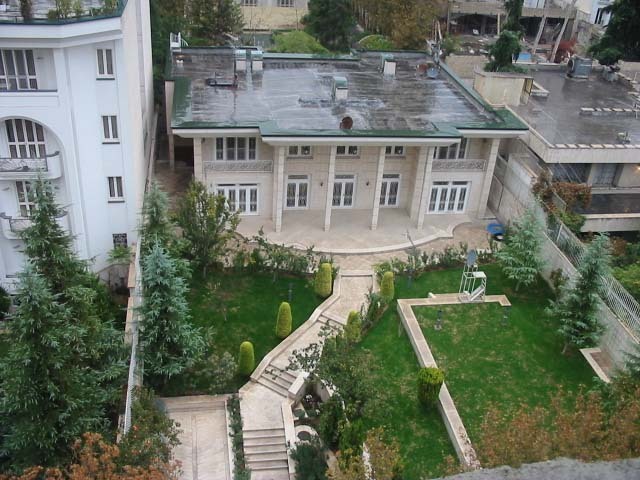 Here is the aerial photo of Mr. Mahsooli's house, who would have been Ahmadi-Nejad's oil minister. Not exactly a spartan working class dwelling! More interestingly however, note the number of satellite dishes on his roof. What, are you some kind of communist who thinks everyone should be poor? That doesn't sound right for a supporter of the Pahlavi kleptocracy. I think the articles on this weblog are somewhat above your intellectual capability. Go back to school, do your homework and when you realise that one can not be a Communist and a Neocon at the same time come back. seyed hassam mir kazemi has been named as the asassin of Neda Soltan , you seem to know a little about him do you think it is possible.Is this the kind of thing he might do for his stinking friends,there are posts out there naming him, personally I could not give a toss if HE did it or not,if naming him limits his movements around Tehran killing others , ah well too bad.thats what I call bad luck, , what type of pig is he , do you hve more on him,Dave.